The nanosatellite SamSat-218 that was placed into orbit during the first launch from Russia’s new Vostochny spaceport in the Far Eastern Amur region has failed to establish radio contact with the mission control, a source in the Russian rocket and space industry told TASS on Wednesday. "No radio contact with the satellite has been available since the launch time, most probably, because it failed to switch on after orbiting," the source said. According to him, a joint meeting of representatives of the Samara State Aerospace University and the Samara-based JSC Progress State Research and Production Space Rocket Center that created the spacecraft will be held on Wednesday. The meeting will focus on the issue of further attempts to establish radio contact with the satellite or recognize it as lost. The SamSat-218 satellite (former name - Contact-Nanosatellite) is the first-ever nanosatellite designed by university students. It was created at the Samara State Aerospace University for testing the algorithms of controlling such miniature devices. The mass of SamSat-218 is just 1.4 kilograms. 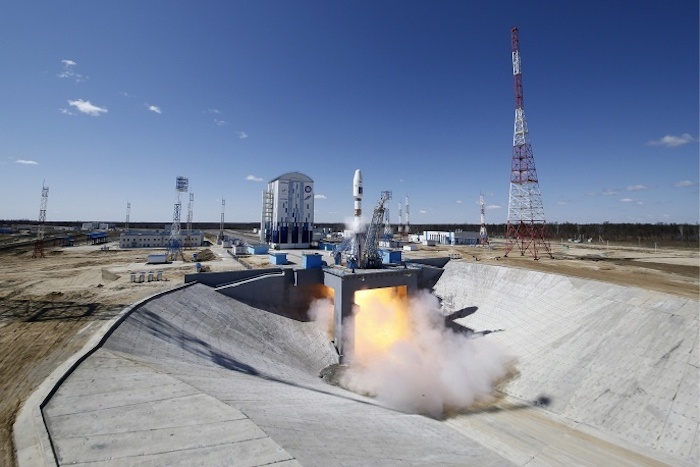 The satellite was launched on April 28 during the first launch from the Vostochny cosmodrome. Along with SamSat-218, the Soyuz-2.1a carrier rocket orbited the Aist-2D and Mikhailo Lomonosov satellites. It was the first launch from the Russian new space center. However the rocket was launched on the second try. It was initially scheduled to be launched in the small hours on April 27. However ninety seconds before blastoff the launch was aborted. The Vostochny spaceport is being built near the town of Uglegorsk in the Amur region, Russia’s Far East. Construction work began in 2010. Vostochny has become the first national civilian cosmodrome that will ensure Russia’s full access to space. The Lomonosov satellite was built by the VNIIEM corporation at the request of Moscow State University. It will be used to study transient light phenomena in the upper atmosphere and radiation parameters of the Earth’s magnetosphere. It is the heaviest satellite of the three launched (625 kg). Its estimated life cycle is three years. The smaller 500 kg satellite, Aist-2D, was made at the space rocket center Progress in cooperation with specialists at the State Aerospace University in Samara. Its instruments are meant for the operation and attitude control of space vehicles, as well as for studying the effects of outer space on onboard equipment and the materials the satellite is made of.